Our old friend Dan VK8AN, who is now silent key, but joined us on a number of our IOTA's, was a Helicopter pilot servicing the offshore oil and gas industry based out of Troughton Island for a number of years. Dan operated a low key station from the island over a number of years he was stationed there doing a 6 week rotation while living in Darwin. 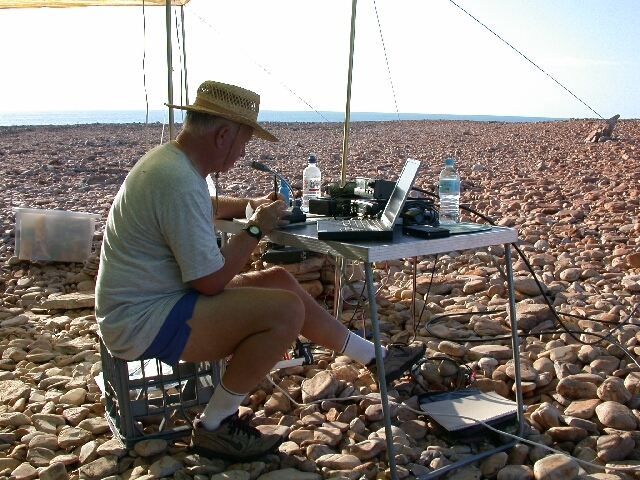 It was Dan who got me, Wally, really involved in IOTA dxpeditioning when I spoke to him one time on 10 metres and he invited me along on the Browse Island OC234 trip. Dan joined Nigel and me on other IOTA's, 243,206, and Bruce KD6WW and me on the run to Viney Island OC266. Dan was one of natures gentlemen, and we miss his friendly, easy going style. Thank you Dan. We will keep the IOTA's rolling as long as we can.